Tribune story that Northbrook and Metra are studying moving the Metra station to the former Grainger property about 1/4 mile south. The article properly notes that this would alleviate trains blocking Shermer Road. I guess this properly puts the prior RTA study into the garbage can with respect to the train station itself, although some of the TOD construction on Shermer Road has been completed or has broken ground. I also wonder what the residents of Shermer Place think of having the train station next door. My initial thought was "the train station should always be downtown". Maybe my thinking is too traditional, as Metra is primarily used by people who drive to the station. For those who don't drive, it seems like a rotten deal to build "transit oriented development", then move the transit farther away. The proposed location isn't unreasonably far, but it's not "downtown", so I agree the study looks to have been mostly in vain. This proposal sounds similar to what is already happening in New Lenox, but with the components of the development happening in a different order. The station would still be downtown, to the extent that there is a downtown. The first question, though, is where is the downtown, whether on Shermer (the traditional place) or on Church/Cherry (where the two neighborhood shopping centers are). There is an office building* next to the station, which has a restaurant space that has problems keeping a tenant, but it seems like development is generally where someone can assemble the land and get something rammed through the Plan Commission, which is pretty tough in an NIMBY community. While the current station is too close to the crossing, and restricted by the triangle, I suppose a new one would need a traffic light. The main concerns I have deal with whether the Downtown Area Plan, sponsored by the RTA, has any relevance to that. On your downtown point, the only transit part of the Downtown Redevelopment Plan is to redevelop the main parking lot with residential and a parking garage. The rest is closer to the Church St. area (the two shopping centers and the development now under construction on Shermer between Waukegan Road and Church). About the only things in the Transit, Parking, Circulation & Access Plan are Metra van feeders (but any industry for them is around the Lake Cook station) and a bike path system (the village posted the bike route signs, but there aren't any bike lanes, just "share the road" signs and markers). I'll also throw in that I thought the reason to acquire the Grainger property was to develop something like Shermer Place, but it wouldn't have been necessary for the village to buy it for that, and what development plan the village would then have for the existing west Metra lot. *There was a murder of a doctor in the building, and I said that's impossible, because I didn't think that the building had any tenants. The station would still be downtown, to the extent that there is a downtown. The first question, though, is where is the downtown, whether on Shermer (the traditional place) or on Church/Cherry (where the two neighborhood shopping centers are)... The main concerns I have deal with whether the Downtown Area Plan, sponsored by the RTA, has any relevance to that. You're more familiar with Northbrook than I am, but I was basically thinking of downtown as the area along Shermer from the station to Church/Cherry, including the shopping plazas. I'll look through the plan when I have more time. How many riders does 422 get along Shermer? Don't know (wasn't published in the NS plan), but can't be many. Unlike 423 in The Glen, you don't see people waiting at the stops, and I bet most of the statistic is for the UPS trips.I've seen a few getting off at Willow and Shermer. 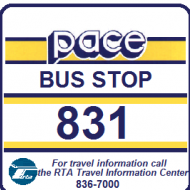 Before the last restructuring, buses would turn back to the garage in the afternoon when the last passenger departed.At that time, the consultants noted that there weren't any feeder passengers to the station (no surprise since the route was parallel), and, as part of that restructuring, cut back morning service northbound. I advocated, including at the meeting for the current restructuring, that north of Willow be replaced with community service, but the current plan indicates that Pace isn't interested. There used to be a 622 (Ryder school bus) feeder from the west side to the station, but that was canceled about 20 years ago. The industrial part of that route was superseded by the 635 Shuttle Bug. My initial thought was "the train station should always be downtown"
That also is the "chicken and egg" problem, as in most suburbs, the village developed around the train station, not vice versa. 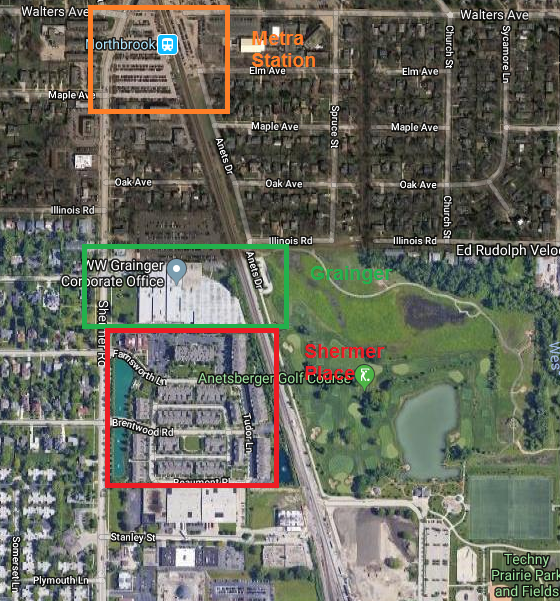 For instance, the area around the Naperville station has its own house numbering system, while the rest of Naperville is on the Chicago one, and the business district is a couple of blocks south. Something like the C&NW North Line seems a bit of an exception to that, as there are some stations such as Indian Hill and Braeside that are not next to a business district. A place like Downers Grove might want to rethink it, with all the trains and feeder buses clogging up Main Street.